Hello, October. I’ve been waiting patiently for you. After spending the coldest twelve months of my life in Northern California, looking mostly like the Michelin Man for half the year, wrapped in layers of clothes that began with thermals and ended with a black, down-filled, zip-up vest and topped with a wool scarf wrapped around my neck, the radiating heat of summer felt especially intense here in the old Pueblo. We desert dwellers count down the days of interminable September anticipating the more lenient-minded October. Although we understand that the first half of October will likely be hot, autumn will begin to reveal itself slowly with a hint of crisp air – perhaps at dusk with the setting of the sun or riding in on the heels of Aurora, the goddess of the dawning morning. With the transition from summer to fall, the feeling arises within me to celebrate, to give thanks for the Harvest moon, my friends and family – some kind of gathering to ignite the holiday season. This year, an early Sunday dinner will fit the bill with Roasted Turkey Roulade, Herb and Cornbread Stuffing, Garlic Mashed Potatoes, Mushroom Gravy, and Cranberry-Orange Sauce. My friends are throwing an Oktoberfest party and the month will close with my second favorite holiday, Halloween. For four years my friend, Michelle and I (The Two Michelle’s) threw four consecutive Halloween costume and food extravaganzas. We both love to bring people together and what better way to do that then to jointly give a party? Our skills complement each other and planning the event can be just as much fun as experiencing it. With her background in the theater and love for thematic elements, Michelle particularly adores set-decoration and took great care converting her party-perfect house, patios and tables into a Halloween emporium. Everywhere the eyes roamed, there was seasonal fun to be appreciated. A feathered owl resting on the hanging pot rack, a scarecrow reclining in a chair, ghosts hanging on doors seemingly floating on a breeze, candelabras holding black candles, shiny metal skeletons dangling from the bathroom ceiling, copper jack o’lanterns glowing in the dark, crows perched on a bare branched tree, just to name a few. Adults and kids alike marveled at the decorations. For my part, I put my graphic arts skills to use creating themed invitations. Music has always been my thing. I have spent countless hours assembling soundtracks to correlate with each themed party to create a fun vibe and to encourage spontaneous dancing throughout the night. Of course, I love all aspects of cooking and the holidays afford me the opportunity to bake to my heart’s content. 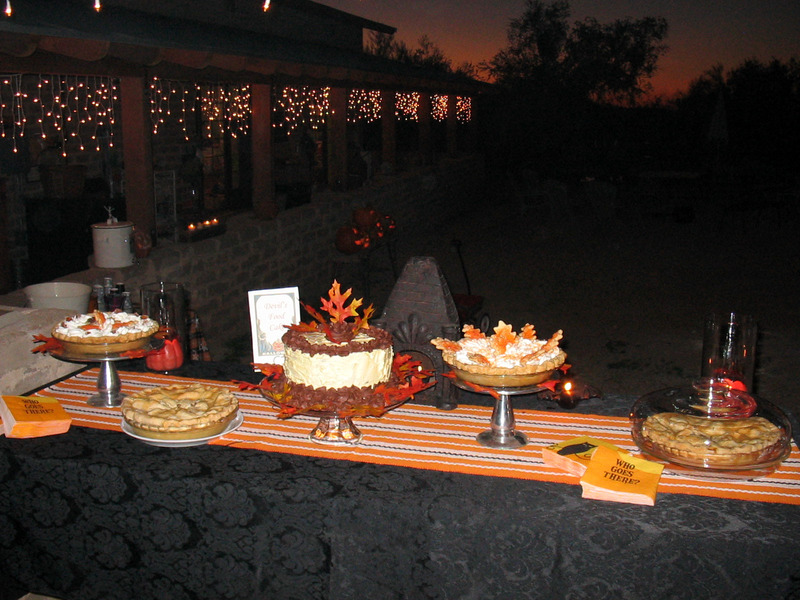 With each Halloween party, I made sure that the desert buffet was bountiful and tasty, baking for weeks in advance. Michelle and I would collaborate on the menu and we’d each be in charge of specific items. When entertaining a large crowd, I often request that guests bring an appetizer to share leaving me to focus on the main dish and sides, both hot and cold, ensuring that the menu is balanced. Michelle’s husband, a dedicated carnivore, likes to get in on the action with his smoker, grill and bread oven – all built by him. Divide and conquer is the operating principal when entertaining a large crowd. What’s a Halloween party without costumes? Boring! The first year, we made it crystal clear the party was not costume optional. 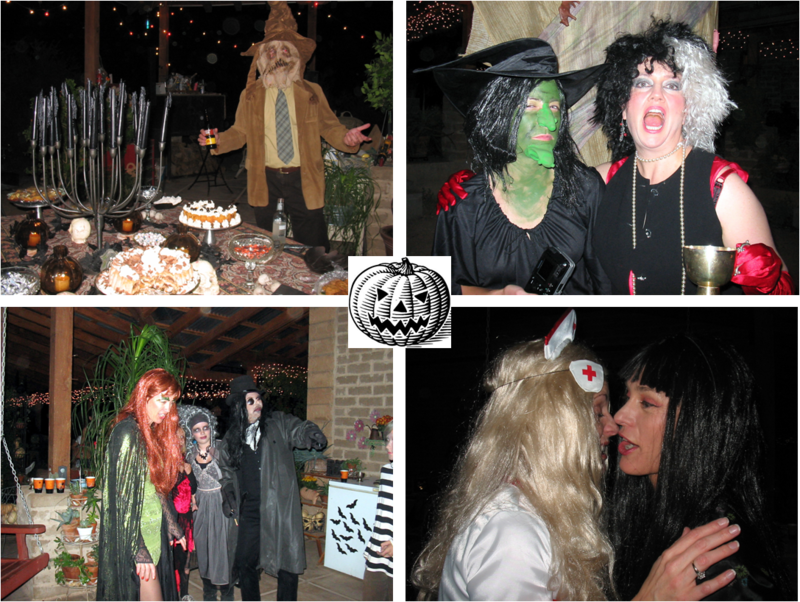 People moaned and groaned, but almost everyone showed up in some kind of get-up – some scary, some funny – and had a great time. Those that didn’t stuck out like a sore thumb and apologized repeatedly for being party poopers. Surfing on the popularity of “Pirates of the Caribbean”, my family dressed up as pirates. Michelle was the personification of Frida Kahlo’s self portrait, “Thorn Necklace with Hummingbird”. Linda transformed into a fortune teller and gave people unnervingly accurate tarot readings – too fun! 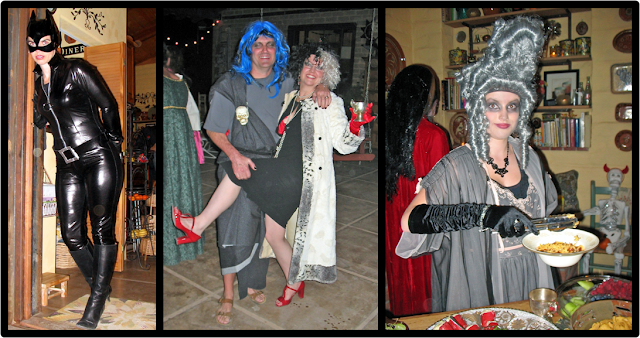 For year two, we decided that it might be easier to get folks motivated to play dress-up by providing a theme. We tossed-out a softball with “Back in Time to 1969”. Lots of hippies, including me, showed up that year, and Michelle made a splash as Mrs. Robinson. I put together a soundtrack that started at 1960 and sequentially progressed through the evening to 1969. Fondue and nibbles for dunking were a huge hit. 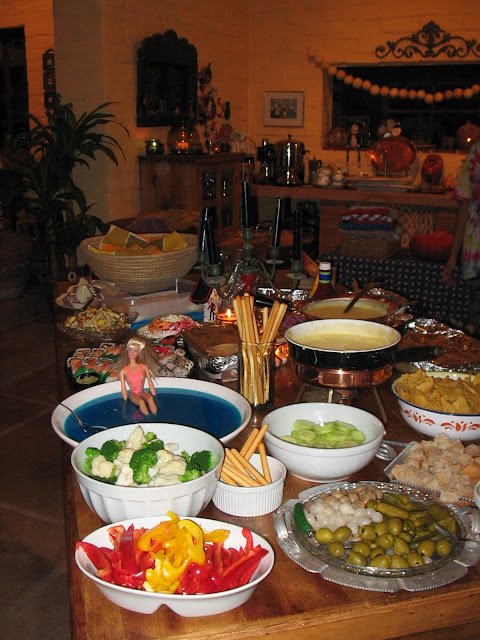 For the buffet, as a joke, Michelle filled a large, shallow white bowl with blue Jell-O and a strategically placed bikini-clad Barbie sitting on the rim of the bowl, feet dipped in the “blue water”. I was pretty surprised at the end of the evening when the gelatin was almost completely gone – kids must have eaten it. Yuck. Year three found us embracing “Dia de Los Muertos” – Day of The Dead – for our theme. Michelle built a large altar, adobe brick by adobe brick, in her courtyard. She also put together a smaller altar, guarded by a gargoyle, dedicated to the memory of beloved pets and animals. On the invitation we invited guests to bring items to place on the altar augmenting our pre-arranged collection of photos and personal mementos of deceased family members and friends. We tucked in religious icons, displayed paper flowers in vases, and lit so many candles that the altar practically vibrated from all the flickering flames. 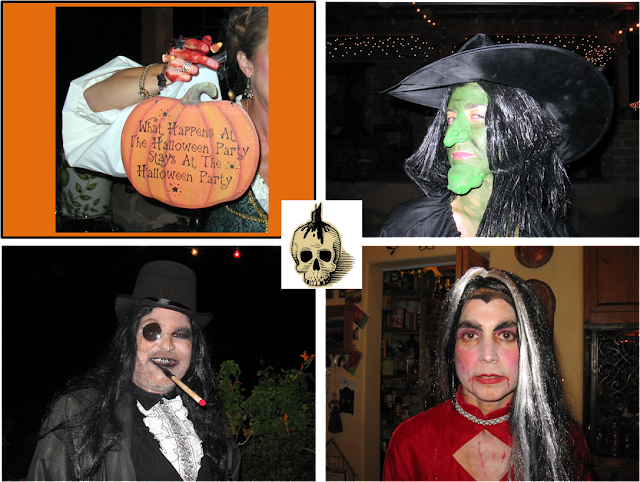 I dressed as a dead Flamenco Dancer, Michelle was a skull-faced señora in traditional dress and a dead cheerleader roamed the yard among the calacas. Lively Latin Music filled the air. For all those great parties, I’d have to say the last one straddled the line between heated fun and nearly being out of control. What else could be expected from the theme, “Chillin’ with The Villains” escalated by a bad-boy soundtrack headlined by none other than AC/DC? I let my freak flag fly high that night by transforming myself into none other than Cruella De Vil. We fueled the party with Pineapple Martinis and pretty soon characters from Batman and James Bond films and antagonists sprung from literature gyrated on the dance floor beneath the jerry-rigged disco ball. Good times! On the night before each Halloween party, we would gather at Michelle’s house for last minute preparations and to carve pumpkins, at least one for each child and a few more just for fun. We would set-up the main buffet by placing empty bowls and platters along with serving utensils on the dining table. Anticipating the swarm of kids, we placed a table in the courtyard loaded with age-appropriate snacks and a keg of homemade root beer. The desert table and bar area was strategically placed under the large covered patio, with close proximity to the “dance floor”. Towards the end of the evening, with a strike of a match, the outdoor fire pit came to life and “kids” of all ages could be found roasting marshmallows over the fire. The kids would slowly disappear back to the playground leaving adults to sit around the fire, swapping stories, and enjoying the bright stars with the hoopla from the dance floor emanating in muted tones across the distance from the large covered patio. Too soon the parties would end leaving us with piles of dirty dishes, sticky floors, and tired feet. We were also left with miles of amusing stories to be told for years to come making all the planning and extra work worth the time and effort. After all, what is life without our friends and family? We should make the most with the time we have been given. Share the fun by throwing a party, and most of all… be the life of the party! P.S. Click on any image with your mouse to enlarge photos or graphics posted in this blog. This pumpkin pie is a combination of our Grandma Elsie's batter and Libby's recipe that is printed on every can of pumpkin puree. To make pumpkin puree from scratch you would peel, cube, cook and mash small pumpkins that are labeled "sweet". This one of the few occasions where we honestly like using canned puree better than fresh based on taste, texture and ease of use. You may choose to substitute one rounded tablespoon pumpkin pie spice for the cinnamon, ginger, cloves and nutmeg, however the taste will be slightly different. Do not freeze a pumpkin pie, as this will cause the crust to separate from the filling. 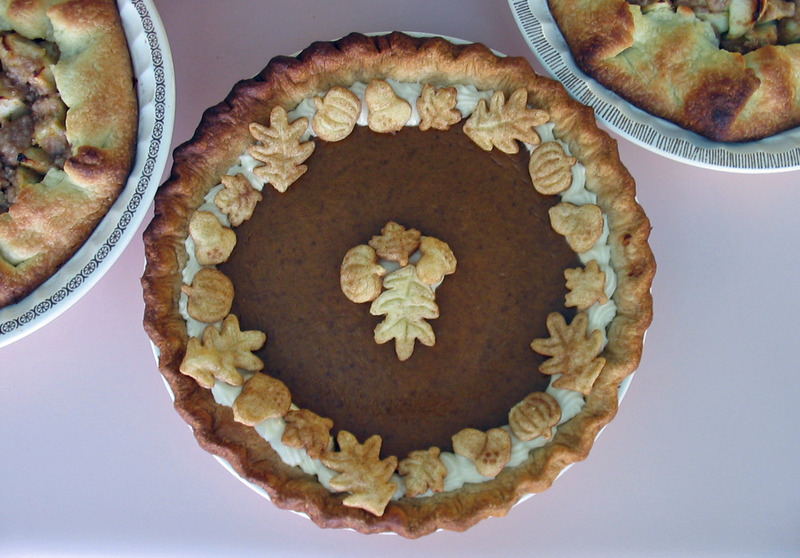 I like to garnish the pies with piped Cream Cheese Frosting flavored with Amaretto liqueur and cinnamon-sugar dusted Pie Crust Cookies made from the leftover dough. 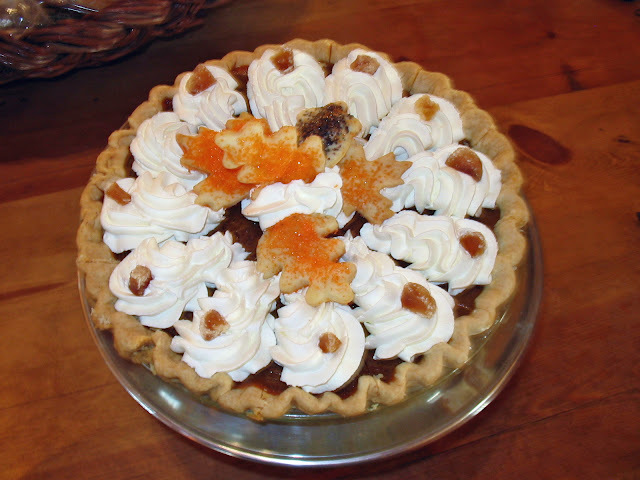 In the photo above, Linda pre-cut the pie and decorated each serving with whipped cream and a little slice of candied ginger. Cookies placed in the center add seasonal fun. As part of a dessert buffet, the pies are gorgeous displayed with Apple Crostatas or All American Apple Pies and Pecan Tassies. Homemade marshmallows or meringue cookies are a fun addition as well as brownies for the die-hard chocolate crowd. 1. Arrange two oven racks so one sits in the middle or lower third of the oven and the other on the top shelf or upper third. Place a large cookie sheet on the top rack. The cookie sheet will act as a shield for the pies as they bake to prevent the crust and surface of pie from over-browning. Preheat oven to 375°F. 2. Mix sugar, salt, cinnamon, ginger, cloves and nutmeg in a small bowl. Beat eggs in a large bowl. Stir in pumpkin, vanilla extract and sugar-spice mixture. Gradually stir in evaporated milk or half-and-half. Pour evenly into both pie shells. thanks for sharing the pie recipe too.